Technologies are meant to help improve work efficiency and productivity. In this day and age of technology we can't afford our SERVERS, COMPUTERS or SYSTEMS to be down?! Do you know how much damage and losses it can cause?! I could lose a DEAL! I could lose all my DOCUMENTS! And even end up losing my MIND! Therefore, please take proper measures and never again stress yourself over such detrimental IT issues. Why worry when you can have someone to worry for you? GIVE IT A GO! Check out Adhoc Services for only $119 per visit for the 1st hour and $78 for subsequent hours. If you like our services why not check out our Premium maintenance packages? 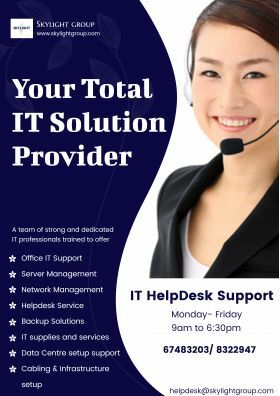 It would be my utmost delighted and pleasure to share with you our IT maintenance service packages and help YOU choose one that is BEST suited for you! Be rest assured because, with us is a team of Friendly and Dedicated Professional IT Personals who are EXPERTS in this area. There is only so much we can say but actions speak louder than words. Give us this opportunity to serve you and serve you well! Give us a chance to show our sincerity! We love what we do and you should too! Email us now at sales@skylightgroup.com for GREAT deals. Hesitate no more! Call Skylight now at 67483203/ 83229471 and never lose your sanity again! Because you know WE CARE! Feel free to drop us an email at helpdesk@skylightgroup.com. Our friendly staff awaits you!